Until a couple years ago, I never gave much thought to who was behind the high-pitched voice of our beloved Elmo. But if you had asked me, I would have guessed a woman. Probably a white one. And boy would I have been wrong. Honestly, I did a double-take when I learned that Elmo was a black man. It didn’t matter to me; it just wasn’t what I had expected. And ever since I saw him (with Elmo) on YouTube, doing an interview on some British talk show, I have been intrigued by his story. 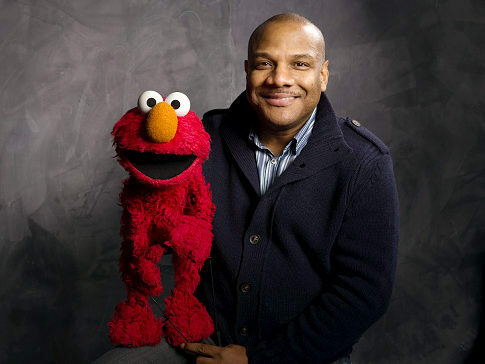 Being Elmo is a look at the life of Kevin Clash, the man behind the muppet who stole our hearts. I adored every second of this film. Unlike some documentaries, Being Elmo gives you a “character” to latch onto, to root for — and that’s what makes it stick. We start with Kevin’s humble childhood in Baltimore, with parents who were surprisingly supportive of such an unusual endeavor. (Meanwhile his siblings didn’t get it, and many of his peers mocked him for it.) We laugh when young Kevin cuts up his father’s coat to make his first muppet. We marvel when he puts on shows for the neighborhood kids. We cheer when he gets his first job at a local television station. And we cry (or at least I did) when he goes to New York City to meet Frank Oz and Jim Henson. But then the film switches gears and reveals what Kevin sacrificed to become such a success: his family. At some point he married the girl he had been dating since 19, and they had a daughter. 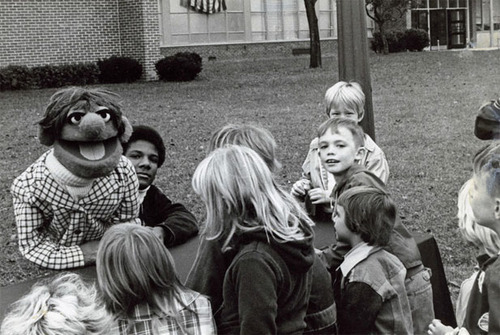 But Kevin was always traveling, entertaining other children with Elmo, and becoming a bigger and bigger part of Sesame Street (writer, producer, director). Unfortunately that kept him away from his wife — they eventually divorced — and worst of all, from his daughter. But maybe that’s just what some people are destined for. Like, isn’t the work that Kevin was doing important enough to justify his absence? His family might say no, but when I think about all the children who benefit from Sesame Street — all the dying kids who just want a hug and kiss from Elmo — I have a hard time agreeing. Anyway. All this is a really long way of saying that Being Elmo is an awesome documentary about a really interesting, quiet figure who has undoubtedly touched your life, even if you had no idea. Also, it shows you that there is SO much more to puppeteering than just sticking your hand in a muppet and making a funny voice. I didn’t grow up watching Elmo, but this post makes me think: Literature and media often feature the concept of regret by those who neglect their family to pursue their career. The moral is almost always: Family comes first. However, it’s interesting to view it with the other lense, that what they’re doing is important enough for them to sacrifice their family for it. Neither is inherently the “right” choice. You just rarely ever see the portrayal of the latter. I never would have pictured this man as being the voice of Elmo, either! I have two other similar books. One is by Yeardley Smith on being the voice of Bart Simpson. And the other is about the person in the Big Bird suit. I haven’t read either yet, but they’re sitting on my TBR pile. My partner read… I think it was Barbara Walters’ autobiography… and she said that one of the most interesting points that Walters makes is that she says it is impossible to have a super successful show business career, a good marriage, and be a good parent. She says that she’s tried it every which way, and it can’t be done. Unlike Clash, Walters says that you can have two of those three (so one could have a super successful show business career *and* be a good parent), but all three are impossible. Good point! Hmm… a theme worth exploring, perhaps. The public must be calling for our beloved “comic” figures to be unmasked! Maybe it’s related to the resurgence of the superhero trend?